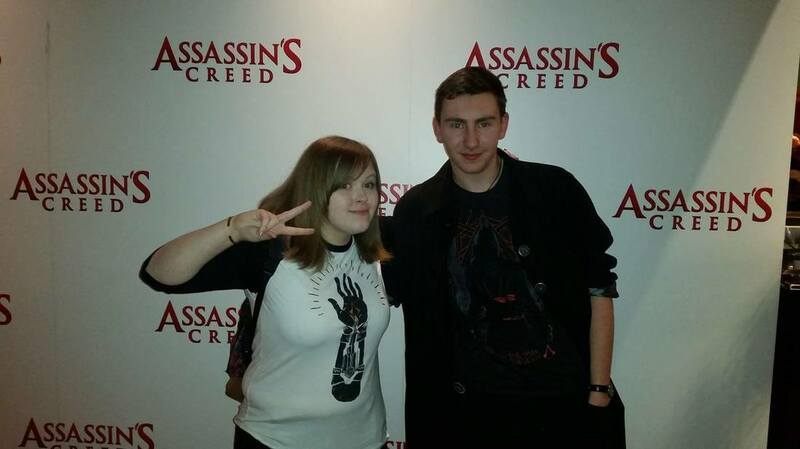 On the 18th December 2016, I attended an Assassin's Creed Movie Fan Screening in London. Special thanks to UbiJollyCharly and Ubi-QuB3. This Article contains Minor Spoilers for the Assassin's Creed Movie. When Laureline (UbiJollyCharly) invited me to the Assassin's Creed Fan Screening, I was quite surprised to be asked, as I had already attended a Press Event (London) and Gamescom (Germany) this year alone. I immediately accepted the invitation, and started packing my bags for London. I couldn't believe that I would be one of the first in the UK to see the Assassin's Creed Movie. On the 18th, I caught the train from Chester (Where my Uni is) to London Euston. There I met Dom (Ubi-QuB3) from the Assassin's Creed Team. We then walked to the hotel and prepared for the Fan Screening. 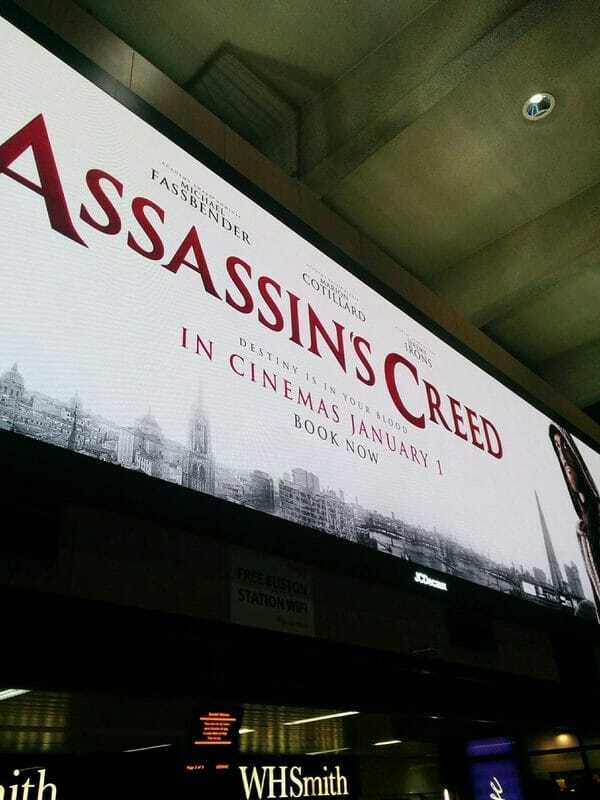 Movie Advertisement at London Euston. After about an hour, we travelled to the event which was being held in the West End. Immediately we knew we were in the right place, as everyone in sight wore Assassin's Creed T-shirts and Hoodies. The fans were mainly Assassin's Creed Cosplayers, and many others who had won Fox Competitions. Before the screening I spoke to several AC Fans, and they were all excited for the Movie. Beth from Amazonian Cosplay was wearing her Maria Robes, which looked absolutely amazing! The Event was packed, and all the AC Fans were taking pictures with the Aguilar and Maria Robes which were on display. After 45 minutes, everyone began to surrender their phones to security and enter the screening. We all took our seats, and waited for the Movie to begin. I could tell that everyone in the room was really excited to see the movie early. I certainly was! The lights went out, and we were greeted with a message from Michael Fassbender and Justin Kurzel. They told us that we were amongst the first in the UK to see the Assassin's Creed Movie, and that they had worked very hard on it. The film began, and I couldn't help but pick apart the first 20 minutes (As I had seen a different version at a Press Event in May). I could spot major differences to the footage I had seen previously in May. Bits of which I had enjoyed had been removed, such as music by The Black Angels and the Apple Pickings Poem by Robert Frost. The little girl saying "Your Blood is not your Own" to Cal as he ran around the Abstergo facility was also unfortunately removed. The first 20 were not as creepy as what I had seen previously, but still made me feel sorry for Cal. After 20 minutes had passed and Cal was placed in the Animus, I could stop comparing the Movie to the footage I had previously seen. I watched it as a fan of Assassin's Creed and Movies in general. I was overall really impressed with the film. ​The Animus 3.5 was absolutely great, and the cuts between Cal and Aguilar made total sense. The Bleeding effect was creepy once again, and felt like a real problem that could drive subjects insane. From the start I felt really sorry for Cal. His life is pain. The colours used in the film are extremely artistic, and Kurzel's style shines through. I found myself in awe at many of the scenes. I was very impressed with the film, and even though the plot was not as complicated as in the games (as not to confuse new audience members), it felt like Assassin's Creed. ​ By this, I mean it actually feels like an Assassin's Creed Story that fits into the Universe, and not a film based on Assassin's Creed. The film was great, and I hope that everyone else enjoys it as much as I did. Please don't be put off by Critics. Go and see the Movie yourselves, and let me know what you think! Something I really liked that had not been in the footage (Press Event) were flashbacks and Memories as Cal is given the Lethal Injection. One of them shows him as a boy with his mother. This only adds to the weight of empathy we feel towards Cal. This was a great addition! The device used to cut Aguilar's finger is much more ceremonial than anything we have seen in the past. I had previously seen the device, as it is on display in ArcLight Cinema in Hollywood, but did not know it's purpose. It was also the first time in the franchise that we had actually seen an Assassin lose a finger! Cal becoming a Modern Day Assassin! Ever since the death of Desmond, i've been hoping to see a strong lead Assassin in the franchise. Cal could well be the next big Modern Day Assassin. The Bleeding Effect hits him quickly, and his abilities are clearly impressive! I would love to see him again. People who do not comply with the Animus become Docile! This was scary to see. People who do not use the Animus properly lose their minds! ​The inclusion of Christopher Columbus. Does this contradict established Lore? "We work in the Darkness to serve the Light". Mary Lynch. The Apple of Eden is now green when used. The ways in which the Apple could remove Violence are never explained. After the film, we watched the Leap of Faith trailer live. So glad he performed it without hurting himself! Thank you so much to everyone at Ubisoft and Fox who made this event possible! Overall, I really enjoyed the film. and plan on seeing it again soon. Thanks again to Dom and Laureline from the Assassin's Creed Team!